Union Minister of Information and Broadcasting Smriti Irani on Sunday slammed the Left Front government in Tripura for the lawlessness of the state. 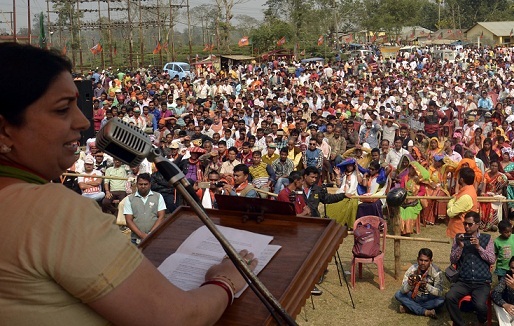 She was addressing an election rally at Unakuti in Tripura. I & B minister was critical of Tripura chief minister for being loath to control the rising incidents of murders in the state. “Instead he is receiving awards from outside the state,” Smriti Irani said. The union minister slammed the Left Front government for its failure on all fronts. Interestingly, taking cue from union home minister Rajnath Singh, Smriti Irani also attacked the Left Front government for not providing electricity to many villages. Irani shouted “Chalo Paltai” slogan to change the government and vote BJP to power. The rally was also attended by BJP state observer Sunil Deodhar. Home Minister Rajnath Singh also held a road show in the streets of Tripura on Sunday.